Home-made pizza is a simple, workhorse recipe suitable for weekday dinners, yet it does require advance preparation: The dough must be made, allowed to rise, topped and then baked. This volume from the How to Cook Master Series endeavors to solve the problem of how to put pizza on the table from start to finish in less than 90 minutes. One of a unique collection of beautifully hardbound, single topic cookbooks from the editors of Cook's Illustrated, the publication legendary for perfecting a recipe through years of fanatical kitchen testing. By using rapid rise yeast and a preheated oven as a proofing box, you can now make pizza on a Tuesday night. Of course, we also include a 24-hour dough recipe when you have the time to prepare ahead. You will learn foolproof recipes for everything from thin-crust to grilled pizza, plus a variety of innovative sauces and toppings. 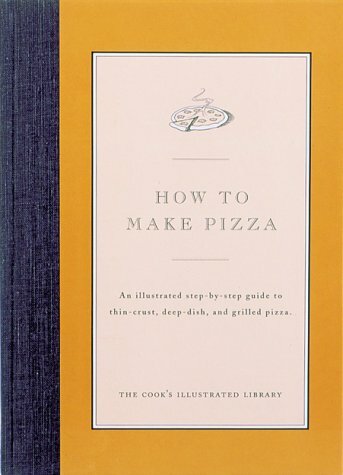 How to Make Pizza is sure to be one of the most useful additions to your kitchen library.